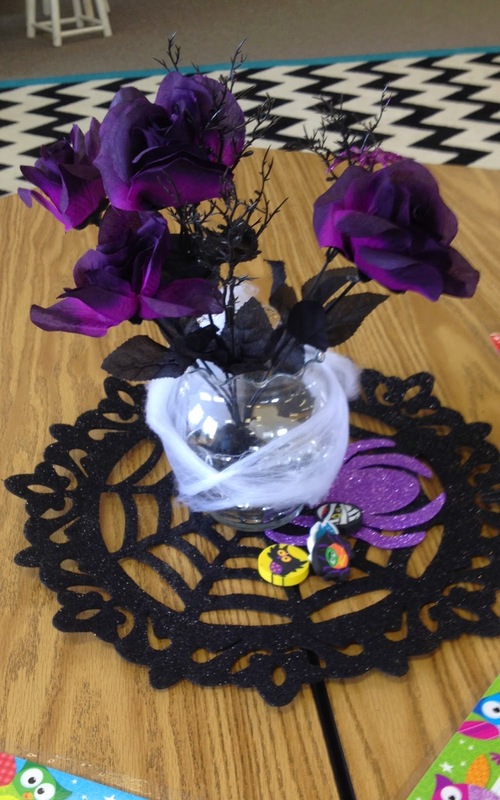 In 5th Grade with Teacher Julia: Halloween Decorations Up in the Classroom! I love fake spider webs! I already had the student tables decorated. This is the before. This is the after! Spooky stuff! I got the Halloween erasers at the dollar store as well! The spider web was being sold as a wall decoration, but I think they look great on the tables! Classroom Library with skeleton, pumpkin and giant spider! I got the lanterns that are hanging from the ceiling. They take batteries and glow, but I didn't put batteries in (yet). Door mat and some window clings for our front door. I also put some window clings on the classroom windows!